More housing discussion. Mr. Cho is the one who really gets it in this discussion. It was intentional and outright fraud from the beginning and it was all going good until you had to foreclose on people. This will be interesting even if it gets papered over in the end. Greetings everyone! The monthly update is a few days late as I'm busying partying like it is 1999 since the Dow is over 11,000! The crazy march higher continues to vault us to higher and higher levels and like all investors in all manias, we shall continue pouring fuel on the speculative fire until there is nothing left to burn. I've eluded to how this feels so much like 1999 and 2000 and also like 2007, but that doesn't make it easier to endure the unstopping, irrational, and unfounded rally onward. At some point it won't move higher, but till then I will continue holding my nose and attempting to identify where the action is turning (if it ever does). One other note. I'm not a particularly sentimental guy (my wife is laughing at the understatement in that comment) and so the first year anniversary of the Goatmug Blog came and went in August without even a passing reference from your scribe. Now, as I upload these comments, notice that this is the blog's 100th Post. So, thank you for reading and thank you to those that comment. I appreciate that you take a few moments to stop by and read these random thoughts. As I've written recently, the markets will not go anywhere without bank participation. We have many overhead issues like a terrible rate curve, Robogate, and bad loans on balance sheets, but that is not keeping those major banks from attempting to break out. I've captured an updated shot of the XLF here and my thoughts are that if this etf can break just a bit higher through $15 we should see the 16.85 area in this issue. Rails continue to show increasing levels of traffic versus 2009 levels, but they remain below 2008 numbers. We are seeing an increasing trend of mothballed (stored) rail cars coming back into the moving inventory. Some 17,000 rail cars were brought back into service in September, so this should be an indication that rails are seeing demand and a need to put these things to work. VEHICLES and SCRAP tonnage are ways to measure the economic health of the country. Both metrics continue to increase and show continued economic improvement. 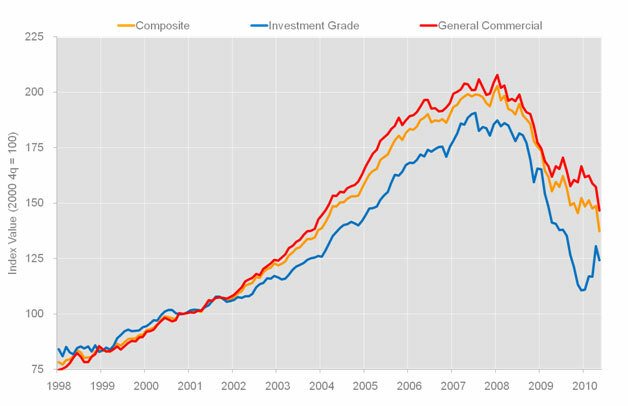 If there is one other area that continues to languish other than housing, it is commercial real estate. 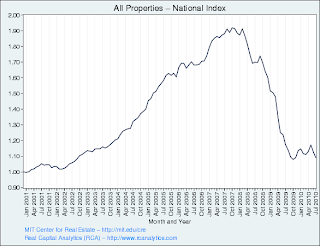 MIT and Moody's recent national price index shows that there is not a recovery in commercial real estate pricing. CO-STAR - Remember, Costar's data is as of July, so no new changes appear here. The housing rally appears to be cooling after the government induced frenzy abated. 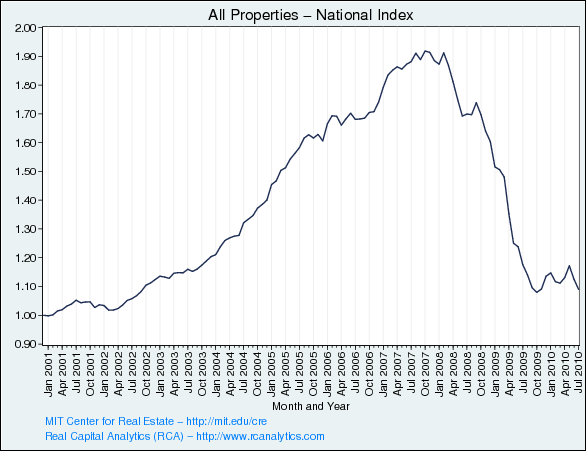 Home prices now have begun to drop and I fully expect to see this trend to continue. As I mentioned several times earlier this year, the interference in the home market by the government is causing lots of damage. We can clearly see that the government's use of enticements to purchase with the first time home buyer's credit and other programs caused buyers to rush in and therefore to have prices launch higher. Now that those programs have concluded, we are seeing a regression of prices that are more "normal". There are several differing opinions as to what the fall out of ROBOGATE will be as inventory is essentially pushed aside and becomes unavailable. Some believe this will actually make prices for available non-foreclosed homes go higher as there will be a demand for the reduced inventory. That may be true, but I doubt it. As I made reference to earlier, I think any foreclosed home (even previously foreclosed) will now be sold without title insurance which means cash buyers only, and this also means it will be priced at rock bottom prices. Other non-foreclosed homes may fare better, but prices will still fall. The Monster Employment Index continues to improve. This suggests that employers are listing more jobs on their sites. There is no breakdown on if these new added positions are temporary or contract positions. This is a great development. CFO's optimism dropped significantly in September. We can only guess why! Specifically, the CFO's attitudes about the recovery of the economy are on par with where they were in September of 2008. While the executives are a bit more positive about their own firms, they certainly did get more pessimistic. It is interesting that this is a real trend. When people are asked about their own situation, they are now suggesting that they are ok, but then when asked to comment on the outlook and conditions of others, they get downright bearish. I guess CFOs are no different. This type of negative world view does not foster the return to the "old" normal of spending and living La Vida Loca as my friend Ricky Martin would sing. The scrap metal index continues to move higher. Alan Greenspan used this as a gauge for economic health and improvement. The WLI data is also improving as the alarm bells for the double dip recession are turned off. As we've commented several times, this data set seems absolutely driven by money supply variables. As liquidity is withdrawn, we'll see these numbers fall. Until that time, we will not see a drop in the WLI nor any other investment index or asset. As of yesterday, the Financial Conditions Index hit a flat zero and today's market action should push the FCI into positive territory. 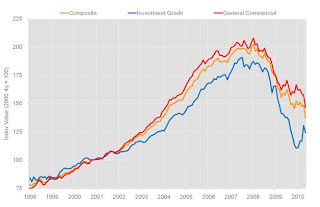 This data would suggest that there is an expansion underway and there is no recession! This indicator continues to suggest that the market will go south. Remember, Coppock is a 14 month rolling average and therefore is very slow to give a signal. 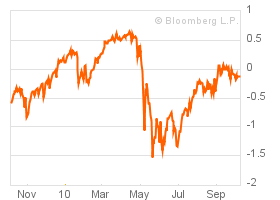 In fact, the Dow would actually need to hit 12,250 in order for it to reverse and signal a buy. I don't use the COPPOCK for much besides a confirmation, but the indicator would miss another 10% move up here if the DJIA actually did run to that number. 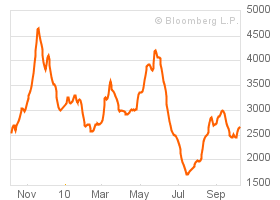 Baltic Dry Goods Index looked as though it was consolidating and now appears to be moving higher. Look out below! No abatement in the free fall here. If the FED and Treasury have some plan to glide us into a safe place while they work out the balancing act of higher national debt and a devalued currency, it will be great to see. I do anticipate a post election move up in the value of the dollar as they're going to have to let off the accelerator at some point. 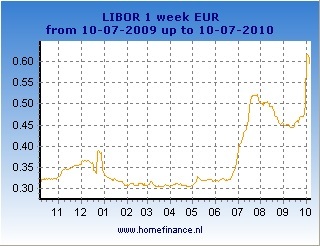 I've posted 1 week and 6 month Euribor rates here. 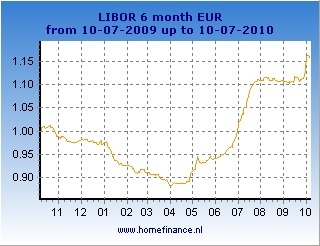 Since 9/30/2010 these rates have been climbing and I've been monitoring them. These rates are the highest they have been in a year. I'm not sure if the move up is a sign of distress in the market, or a comparative move up in regard to a change in economic outlook and rate projections for the Euro area. Given that the United States continues to want to go the opposite direction and drive rates lower, is this move simply a reflection that the investment world knows that Europeans are not going to go lower and therefore will be higher? We know that Irish banks and other banking institutions in Europe are still wounded. My concern is that we'll see another credit deterioration again due to problems in Europe. I have to wrap this up quickly. No matter where we are here in this current rally, we need to remember it is largely based on the USD. September was an incredible month where the major indicies were up about 9% for the month. 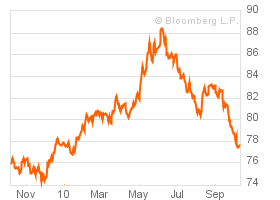 Is it any wonder the markets were up so much when you consider that the USD was down 7%? As long as the Euro is higher, Dollar is lower, and the FED is talking about continued or more buying of treasuries (QE or QE2) then we will have more of the same. Wheat, Corn, Sugar, Oil, Gold, Silver, etc will all go higher, and so will emerging markets investments. We don't have to be too smart to continue riding the train and letting the conductor (Ben) keep punching our ticket. We just want to make sure that we are looking out in front of this train to ensure that the tracks haven't been blown up. So, I wish I could be more sophisticated, but the trade we've advocated for months is still the trade of choice. Commodities and anything outside the US will do just fine.